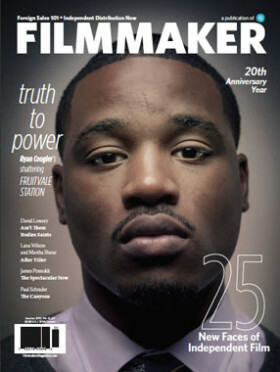 The summer issue of Filmmaker Magazine has a comprehensive write up on MSiF. “Nervous laughter fills the air as a box of surgical masks is passed. Everyone is instructed to take one and place it over their mouths. With masks in position, the group of 12 is quickly ushered into an elevator. After a few moments there is a jolt — the doors open and everyone slowly funnels out. The seventh floor of the New School has been transformed into a sci-fi world. Debris covers the ground, and strange sounds echo down the halls. A lone girl staggers forward, her face concealed by a long mane of black hair. With head hung down and bloody tissues clenched tightly in each of her fists, she stops directly in front of us. Over the next 60 minutes our group will step into an experience called My Sky Is Falling. Guided by immersive performances and sensor technologies (everyone wears a bracelet that takes emotional arousal measurements — heart rate, skin conductance and motion), participants uncover a dystopian sci-fi tale that acts as a metaphor for the real-world experience of aging out of foster care. The data collected is the foundation for a framework that strives to create empathy, measure social impact and drive engagement using technology.